O God, who for the defense of the Catholic faith made the Priest Saint Petr Canisius strong in virtue and in learning, grant, through his intercession, that those who seek the truth may joyfully find you, their God, and that your faithful people may persevere in confession you. Through our Lord Jesus Christ, your Son, who lives and reigns with you in the unity of the Holy Spirit, one God, for ever and ever. St. Peter Canisius (1521-1597) was born at Nijmegen, Holland, at the very time that Luther began to rebel against the Church and St. Ignatius Loyola was laying the foundations of the Jesuit Order. After studying the arts, civil law and theology, St. Peter joined the Jesuit Order and was ordained a priest in 1546. He is noted especially for the following services to the Church: he defended the Catholic faith against the Protestants; by preaching, writing, founding colleges and seminaries, he caused Catholic life to flourish; he rendered invaluable services to the ecumenical Council of Trent; he wrote many Catechisms which were translated into twelve languages in his own life time. He died in Fribourg, Switzerland. According to the 1962 Missal of St. John XXIII the Extraordinary Form of the Roman Rite, today is the feast of St. Thomas, now celebrated July 3. 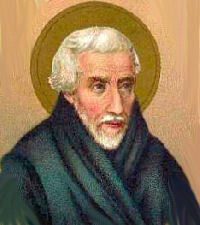 Previously St. Peter Canisius' feast was celebrated on April 27. Today is the fifth of the O Antiphons. It is the Sun, the Redeemer, whom we await. "I am the light [the sun] of the world" (John 8:12). Christ is the light of the world because of the faith which He has infused into souls. He has enlightened the world by His teaching and by the example of His life. In the crib, in Nazareth, on the cross on Calvary, in the tabernacle of our churches, He answers the eternal questioning of the benighted soul. Peter Canisius, the remarkable Jesuit who almost single-handedly reevangelized Central Europe, founded dozens of colleges, contributed to the rebirth of Catholicism by his prodigious writings, and laid the groundwork for the Catholic Reformation north of the Alps. He was born at Nijmegen, Holland, in 1521, and his father was an instructor to princes in the court of the duke of Lorraine. St. Peter Canisius was part of a movement for religious reform as a very young man and in 1543, after attending a retreat given by Blessed Peter Favre, joined the Jesuits and was the eighth professed member of the Society of Jesus. He worked first in the city of Cologne, becoming a spokesman for the Catholic party. He became a consultor to the cardinal of Augsburg at the Council of Trent and in 1547 was called by St. Ignatius to Rome. He was sent to Sicily to teach, then, after his solemn profession in Rome, was sent back to Germany as the first superior of the German province of the Jesuits. Peter next began to restore and found colleges, first in Vienna and Prague, and then in Munich, Innsbruck, and throughout northern Germany. He attracted vocations to the Jesuits, and the society began to flourish in Central Europe. He organized the Jesuits into a compact unit and made the society a leading force in the Counter-Reformation. He was in contact with all the Catholic leaders in Germany, and wrote fourteen hundred letters giving support to those laboring for reform. He was the adviser of the emperor and the confidante of three popes. He was consulted by papal legates and nunciatures and was a severe critic of religious and clerical life in post-Reformation Germany. He recommended far-reaching reforms and had a profound effect upon the education and spiritual life of the clergy. Through his efforts, seminaries were founded, and the popes sent him on important diplomatic missions. In the midst of his many labors, he edited and published editions of the Fathers of the Church, catechisms, spiritual manuals, and textbooks that went into countless editions even in his own lifetime. He died on December 21, 1597, at Fribourg, Switzerland, and was canonized and declared a Doctor of the Church in 1925. Patron: Germany; Catholic press; catechism writers. See Celebrating the Feast of St. Peter Canisius and Celebrating the Feast of St. Thomas the Apostle (Extraordinary Form of the Roman Rite) for ideas.